A bridge on the main highway linking Italy with France collapsed Tuesday in the Italian port city of Genoa during a sudden, violent storm, sending vehicles plunging nearly 150 feet into a heap of rubble below killing at least 35 people and injuring dozens. 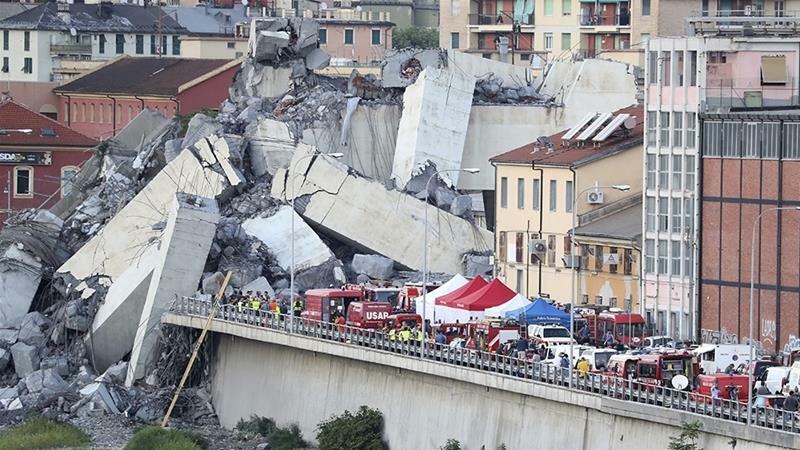 A huge section of the Morandi Bridge collapsed at midday over an industrial zone, sending tons of twisted steel and concrete debris onto warehouses below say reports. The witnesses say 30-35 cars and three heavy trucks were on the 260-foot section of the bridge that collapsed. More than 300 rescue workers and canine crews were on the scene. They used heavy equipment and dogs to search for survivors in the rubble. At least four people were pulled alive from vehicles under the bridge. The female prison inmates who had got onto the roof of Welikada prison and staged a protest from Tuesday morning demanding to protect their fundamental rights decided to call off their protest action yesterday (14th) night. The decision was taken following a discussion they had with the Minister of Justice and Prison Reforms Ms. Thalatha Athukorale. The female inmates decided to call off the protest action after they were promised that solutions would be found for their grievances. The CID has summoned former President Mahinda Rajapakse to be present at their office on 17th August to record a statement in connection with the abduction and assaults made on journalist Keith Noyahr. Noyahr, the former Deputy Editor of ‘Nation’ an English weekly newspaper, was abducted on 22nd May 2008. He was dropped off near his residence a day later badly beaten up and bruised. The summons signed by the Senior DIG of the CID Ravi Senevirathne had been handed over at the official residence of the Former President Mahinda Rajapakse in Wijerama Mawatha Colombo 7 by the OIC of the Organized Crime Investigation Unit, Police Inspector Nishantha Silva on the 12th. Statements have been already recorded from former Defense Secretary Gotabhaya Rajapakse and Speaker Karu Jayasuriya with regard to the incident. Several army personnel including officers attached to the Army Intelligence Directorate and an Army Major were previously arrested and remanded in connection with the case. The All Ceylon Private Bus Workers Association (ACPBWA) has announced that it would launch a strike from midnight today (15th) against new fines imposed by the government for violating road rules. According to ACPBWA the drivers of private bowser and container services, as well as three-wheeler drivers, will join the protest. Stating the sudden increase of new traffic fines was not reasonable ACPBWA has urged the government not to implement the spot fines until the relevant technical equipment was fixed to the road network. However, several other private bus associations have not expressed their willingness to join the strike action stating such action would disrupt the ongoing A/L examination.